Ever since the inception of TNW Academy, it’s been our goal to provide a product that is above and beyond anything else that you’ll find in online education. While gathering world-class instructors is the first step to fulfilling that goal, making the presentation from and the interaction with those instructors has to be the next step. It’s with that in mind that we are thrilled to announce TNW Academy’s new platform, in conjunction with Miami-based LiveNinja. I first had the chance to meet LiveNinja CEO Will Weinraub and his team when I was in Miami for SuperConf back in 2012. The polish on the product, especially considering its young age at the time, was beyond what we typically see anywhere. In the year and few months that have followed, I’ve gotten to see Will and the team continually test, iterate and improve LiveNinja, molding it into an incredible portal for one-on-one learning online. With the release of TNW Academy on LiveNinja, we’re taking cutting-edge technology and producing an experience that is positively unlike anything that you’ve seen in online learning. Live, streaming video from instructors, as well as seamless recorded video playback will combine with presentation sharing in a single browser window. Backed by the newly-released WebRTC project, there will be no need to install extra plugins. All you’ll need to attend an Academy session is a supported browser. Right now that includes Google Chrome and Mozilla Firefox, but plans have already been announced for WebRTC support in Apple Safari. Elements of the Academy class can be moved wherever they are convenient for the attendee. You’ll have real-time chat, as well as Q&A all within the browser. On the back end, TNW’s development team has been hard at work integrating our Paydro payments solution, as well as automating the confirmation and invitation processes. 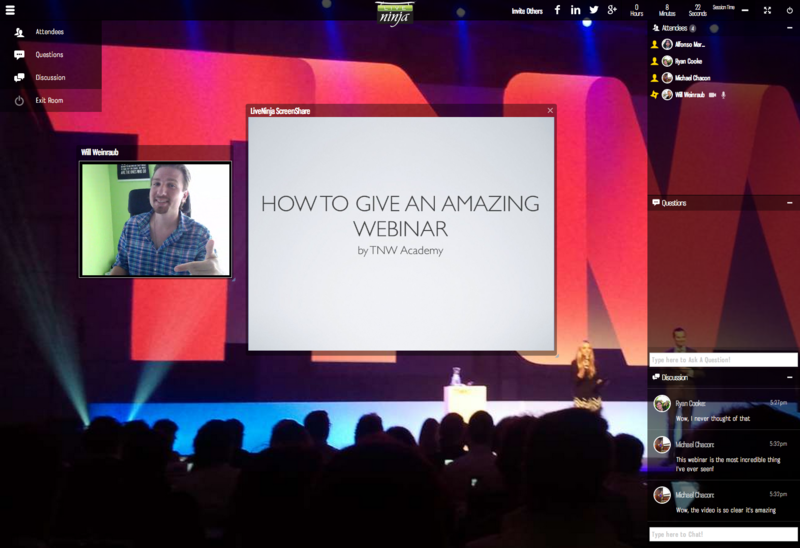 With the LiveNinja platform, TNW Academy classes will no longer be limited to only 100 attendees, and we’ll be pushing the limits with every upcoming class. Our thanks goes out to the LiveNinja team for seeing a vision and turning it into a reality. But none of this would be possible if it weren’t for you, our TNW Academy students. We’re pushing every envelope to develop the absolute best experience for online learning, and this represents a major step within this goal. Thank you.